Do you ever feel like you’re too much? Too emotional? Too analytical? Too intense? Too sensitive? The truth is half the time you feel like you’ve been shot out of a cannon, you’re so wired you just can’t seem to stop, the rest of the time you crash so hard you’re not good for much of anything. You’ve tried a bunch of approaches, but nothing seems to make a difference right away so you give up quickly. Your loved ones may say you’re overreacting, but for you life really is that intense. When you’re working it’s go, go, go but the second you have a break you collapse from exhaustion, feeling like a slug. Meaningful connection is important but when you do finally have some time you end up canceling on your friends (you’re just too exhausted to go out). Sometimes you push so hard that by the weekend your body shuts down, you find yourself dizzy, light-headed (brain fog), and – without getting into too much detail… your stomach isn’t happy. You feel stifled creatively, since you became a mom and/or got a “real” job, you’ve been feeling trapped because you never have time to do the creative work you crave. You’re a serial hobbyist — you collect passions and interests and cycle through them the same way that a chameleon changes color. And speaking of that “real” job, you got into it because you wanted to make a difference but you notice there’s a lot of stuff about the work that feels meaningless — endless paperwork, writing useless reports and all those budget meetings. You set ridiculously high standards for yourself (in fact other people are often intimidated by you) but you always seem to fall short — it just seems that everybody else is so much more “together” than you. If you relate, you’re probably a Highly Excitable Person. You may have heard of the term Highly Sensitive Person but this is a little different. People often describe you as dynamic, intense, sensitive, fiery, restless, passionate or spirited. Because you react so intensely to your world you have this unique ability to literally make yourself sick. Many Highly Excitable People suffer from things like adrenal fatigue, chronic pain, exhaustion and/or digestive problems. You might notice yourself getting sick a lot and/or it takes you FOREVER to recover from things, especially when you’re stressed out. Anxiety is a factor too. You react so intensely to life — your work, dating, your kids– you get so preoccupied with worry, fear or anticipation that it keeps you up at night, keeps you from being able to focus on what you want to do and impacts the way you eat (at the exact time when you should be eating well you reach for that container of chocolate peanut butter cups). There are five types of excitability: Emotional, Sensual, Psychomotor, Intellectual and Imaginational. … form deep connections with other people and living things. … read other people in a way that most people can’t. … pick up on tiny nuances in their environment. … deeply appreciate beauty and often create beautiful, even moving, pieces of art. … use their dynamic energy to bring people together. … be able to think things through to create brilliant connections . … uncover unique angles and perspectives that solve problems and introduce new ways of thinking. … synthesizing seemingly unrelated pieces of information in a way that creates new ideas and approaches. … master many kinds of unrelated things at the same time. … influence others through art or and their intellectual pursuits, understanding the big picture and each individual perspective. The truth is anyone who has achieved anything great is probably highly excitable in one of the five areas. Getting home from a full day of work and having the energy to call up a friend and meet her for dinner. Having some extra time to take a hot bath (with salts!) without obsessing over all the things you should be doing. To your utter shock you actually enjoy yourself in the moment! Sitting down at the end of a busy day, with a cup of tea, and feeling like you got it done — you didn’t spin your wheels, you were actually able to be focused and present on what was important. Looking back over the year and smiling to yourself because of all you were able to do and accomplish. Sitting down with your family for dinner, looking around the room, and feeling happy, not anxious, not preoccupied, just happy. Knowing how to handle the everyday stress of life — family visits, temper tantrums, employee evaluations, traffic jams — without crumpling up in a ball (or screaming back). Have a routine in your life that works, so you write every day, make sure to take a walk, drink your water, etc. but know how to adapt when you need to. Having a clear sense of “having something special to offer” as opposed to always wondered why you’re the one who is always so sick, wired and tired. Being called a thought leader, brilliant or a genius by people you respect. Being asked to write, speak or teach about what is passionate to you. Yes it really is possible! My mission is to help Highly Excitable people use their fire without getting burned or burned out by connecting with their unique powers, balance their energy and feel a sense of accomplishment in their life. To help you explore your own unique gifts and how to use them, I created a free Find Your Superpower Course to help you: Identify your individual areas of excitability with an excitability checklist; Customize the name of your own unique superpower; & Explore how you can harness your own power instead of suppressing it or letting it get out of control. Last week I talked about how I've toned myself down and tuned myself out over the years. This can be a tempting thing to do when you seem to react more intensely to things than most people around you. If you are highly excitable though, your greatest excesses may in fact be your greatest assets! To me, the key is not to tone yourself down for others, but to approach the world more consciously so that you can be in control of your own life choices. When well harnessed, excitability can be a wonderful thing. It enables us to pick up on things others might not and experience things in a passionate way. According to Dabrowski, who coined the term “overexcitability,” or “hyperstimulability,” It is a sign of high developmental potential. This is because intensity can help us to become more self-aware. The problem comes when our self-criticism becomes a cycle and we don’t use it to move forward. If you are Intellectually excitable - Your mind goes a mile a minute and you make connections others might not. You are a great problem solver and can come up with new ways of thinking. If left unchecked though, your active mind can keep you from concentrating or sleeping. You might be prone to overanalyzing and drawing hasty conclusions. It might be tempting to suppress your overactive mind through mindless activities such as watching TV, internet or substance use. Finding ways to bring more mindfulness into your life and practicing observing without judgment can help channel your mental energy in a positive direction. If you are Imaginatively excitable - You have an intense imagination. You are a highly creative visionary with an active fantasy life. You are capable of great innovation and thinking outside the box. If you don’t watch yourself though, you might lose touch with reality or have your head in the clouds. You also might be prone to invent and fret about problems that may never happen. If you've stifled you imaginative energy, you might feel stuck or stagnant. With solid grounding, your inspiration can soar. If you have Psychomotor excitability - People might describe you as animated and full of life. You can be inspiring, uplifting and charismatic and revitalize people and situations. When this energy gets out of control, you might be prone to inconsistent energy and/or perpetual overdrive. You might appear as wired, hyperactive or harried. At some point, you might burn out and feel listless and/or restlessly inactive. Make sure you are taking time to hit the pause button every now and then so you don’t burn out. If you are Sensualy excitable - You have an increased awareness of all five senses: sight, smell, taste, touch, and hearing. You have a strong appreciation for aesthetics and tend to be highly perceptive and observant. Because you are more physically sensitive than most, little things can irritate you and you might feel easily over stimulated. You might also be easily distractible by everything around you that others don’t notice. It is possible that you have learned to tune these things out, but this can lead to more problems if you ignore your body’s signals. Check in with yourself regularly to mindfully observe your body. If you are Emotionally excitable - You feel things deeply and may have a tender heart. You are also likely to be compassionate and concerned for others. With extreme positive emotions also comes extreme negative emotions and others might perceive you as overly dramatic. Your strong empathy might drive you to put other’s needs before your own. It is possible you might try to avoid this by distancing yourself from your emotions and the people around you. Acknowledge your depth of emotion and celebrate it. Just take time to process things before you react out of emotion alone. Now, I want you to pick one thing about yourself related to intensity or excitability that you have been self-critical of. Now look at that trait, and describe how it looks when it’s out of control, how it looks when you try to suppress it, and how it looks when it is well harnessed. Understanding how your powers look when they are well harnessed is the first step to using them more efficiently. If you'd like to explore it further, you can check out my Ignite Your Power! program! What do Brene Brown and Lady Gaga Have in Common? You have just enough OCD to keep your ADD in check. Because you notice things other people don't, you can be very particular about things, but you are also highly distracted by your environment. You get a sense of elation from getting to the bottom of your laundry pile! You can get super excited about the little things in life. When that certain song comes up, you can't help but dance or sing to it wherever you are. When you feel like dancing, you're gonna dance and when you feel like singing, you're gonna sing! Only one or two people get your jokes. But that's what makes them so funny! You feel like everyone is more together than you. When you see what others are doing that you aren't, you get that feeling that you should be doing THAT too. You find it hard to live up to your own standards. Being told not to compare yourself to others doesn't help, because you know what YOU should be capable of doing. You feel like you have 100 tabs open in the browser of your mind. Your mind is going a mile a minute and there's so much going on at one time. Sometimes you just want to go climb up a tree. Being an adult is such a drag sometimes. When you are into someone you are REALLY INTO them, but you're afraid you will scare them off. You just need to find someone equally intense (but not high drama). It might take you an hour and a half to pick out a lamp. You have a finely tuned aesthetic sense that no one but you gets. You must be a princess because you can definitely feel that pea!. Things others don't notice annoy the pants off of you and things that annoy others are downright painful. You can get so focused on that new project, you forgot to pee. While it is often hard to concentrate with so much on your mind, when you get excited about a project, you hyperfocus. Last week you were an avid fish collector, and this week you are all about ham radio. You have so many interests you can't possibly do them all at once, so you cycle through them with great enthusiasm. It's not enough to just make something cool, you need to make something revolutionary. You are not satisfied with "good enough," you want to do something that's never been done before. You're kind of like my broken car fan, you're either on full blast or not on at all. Moderation is not your strong suit. You have to be careful not to pick up other people's accents lest they inadvertently think you are making fun of them. You are so good at picking up other people's social cues, you sometimes start to reflect them back. You think of the exact right thing to say when it is no longer relevant. You can be quick on your feet, but sometimes you keep thinking about what you could have said that was better. Part of that conversation you were having happened in your head, so you might have to catch the other person up. Sometimes your mind is ahead of the conversation you're having so you start in the middle of what you were thinking. You can remember Monty Python sketches or song lyrics word for word after hearing them once, but you can't remember what you put on your grocery list earlier that day. If you don't find it meaningful or fun, you probably won't remember it. You have a class clown/teenage boy sense of humor, but a sophisticated intellect. You appreciate the finer things in life, but you also have an appreciation for the absurd. You can solve perplexing puzzles, yet this is the third time you've had to run the washer because you keep forgetting about the wet clothes inside. You rise to a challenge, but struggle with the mundane. No matter how much you like the person you just met, or how long you spoke to them, you will still forget their name by the time they stop talking. In fact the more emotional you feel about them the less likely you are to recall their name! You force yourself to pay attention when people make small talk, but as soon as they talk about something personal or meaningful, you hang on their every word. It's all about connection. Anything less just isn't worth your time. You compile a list of things of things you'd like to accomplish, then go play instead, and then beat yourself up for being "lazy" for not getting anything done. This makes your play time not nearly as much fun! You worry that choosing pictures of people dancing for your excitability blog post will make others think that all excitable people like to dance. You spend a lot of time over-analyzing what people will read into your choices when in fact they are likely more worried about what you think of them. Being Highly Excitable has it's challenges, but it can also be the root of a lot of great powers! Depending on the type of excitability, it can bring excellent problem solving abilities, supremely innovative thinking, deep emotional connection, keen sensory perception and/or dynamic energy. 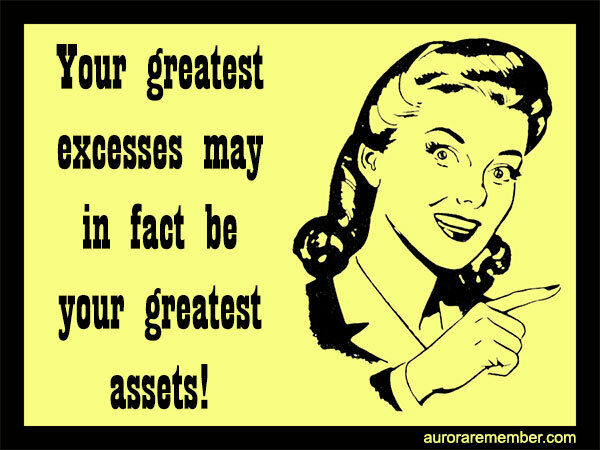 If you ever feel like you are “too much” (too analytical, too spacey, too emotional, too sensitive, too hyper), remember that you excesses might just be your greatest assets! Now it's you're turn! Write in the comments how you know if YOU are Highly Excitable! 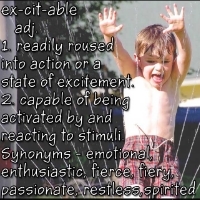 Excitability can be a superpower when harnessed. Sign up for my Find Your Superpower course to find your excitability superpower. Women can join us on our Facebook Group the League of Excitable Women. Photos by Grant Mott Photography, LLC from the Jai Ho Dance Party. Have you ever felt like you are too much? Too intense? Too sensitive? Too analytical? Too scattered? Too emotional? Too dreamy? You might be highly excitable. 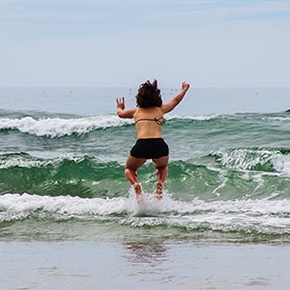 Highly excitable people have an increased ability to perceive and respond to their environment. In other words, they pick up on things that other people don’t and respond more intensely than the average Joe. They tend to be easily excited and inspired. Other words that might be used to describe them include emotional, passionate, fiery, restless, enthusiastic and responsive. Little things bother you or you tend to tune them out. You overthink everything - or keep yourself distracted during the day so your thoughts keep you up. Your mind is often somewhere else creating or imagining things or you feel stifled fitting into a box. You are constantly "on the go" or you easily crash with fatigue. You move quickly from extreme joy to extreme sadness or you do what you can to numb yourself from deep feelings. You drive yourself to do things "just so" or you put things off or not complete them because you believe you can't do them justice. My son has been highly sensitive and reactive since birth. On the day he was born when he finally latched on to feed, the pleased sounds of those in the room made him pop off and look around. I had to feed him in a room alone most of the time because he was too curious about people around him. I couldn't even read a book because the sound of the page turning caught his attention. He was a colicky infant and I believe it was partly due to the fact that he had so much going on in his little head and he couldn't communicate it yet or fully control his body. Over the years he has become a bright and engaging boy. He has the ability to express great empathy but at other times likes to do his own thing without thought of how it might affect others. He also reacts to things in a very extreme way, both positively and negatively. I was doing some research based on his challenges adjusting to the behavior expectations of school this year and I came upon the concept of overexcitabilities. It not only hit the nail on the head with everything I saw in him, but explained so much of my own life. - Heightened awareness of the senses. Since I was young I've been highly sensitive to my physical environment. Little things bothered me so I learned to tune them out. Eventually I could no longer tune them out as I experienced the chronic pain of Fibromyalgia. Over the years I've tried many things to help but very little stuck. The last few years I've been able to pinpoint a few things that really made a difference and stuck with them in a way I never thought possible for me before. I also lost and kept off 40 lbs in the process. - Increased intensity of thought. I was almost held back in kindergarten for asking too many questions. When I was evaluated by a child psychologist, he said, "she's not a smaller apple, she's an orange." This became my mantra for much of my schooling. I was tested twice for giftedness and learning disabilities and while I was never identified as learning disabled, I never figured out how to work to my full potential in school until my masters program. Now that I can focus my areas of further learning on things I'm passionate about, I can excel in a way I never could if my heart wasn't in it. I was definitely a daydreamer in school and even tend to be so at work. I can stay on track for a bit, but my mind is often somewhere other than where I am in the moment. Before I had a child I could indulge my creativity outside of work hours, but since then I've lost much of my outlets for creative expression. Without this outlet my mind tends to wander even more so I am making more of a priority to create in my life. From the time I hit puberty, every spring I would fall into a mild depression and fatigue. The stress of school built up for me so that I needed the full summer break to recover. A few years ago I was tested for adrenal fatigue and it turned out my body produced excess stimulating hormones and not enough calming. Ironically, my chronic fatigue was due to an excess of energy. I went into a job in schools because I knew I needed the time off. Only recently did it occur to me that I went right back in to the very system it took me months to recover from every year. Now I'm cutting back my school hours to explore my passion helping others explore theirs. While some kids like to pick up stray dogs, I tended to pick up stray people. Our family took in several friends who were having a hard time. As an adult, a few especially stressful living situations ended up leaving me with a significant physical cost. I used to value in myself my ability to get along with challenging people. Now I realize the test is not how well I can get along with everybody, but how well I can take care of myself.Throughout my life, I've been an extremist. I would joke that I had just enough OCD to keep my ADD in check. I had high standards but impulsivity. I would dive into something, then throw the baby out with the bath water. I sought a partner who compensated for me rather than complemented me. Therefore he saw the same faults in me as I saw in myself. After 5 years of managing a home as a single working mother, I'm now with someone who doesn't love me despite my quirks, but because of them. When excitability is harnessed, you may experience life with great passion and joy. If not well channeled though, it can lead to overwhelm, anxiety, fatigue and even chronic pain. It can also affect our personal relationships if we are perceived as "overreacting" to things and our productivity can suffer when expectations don't match reality and priorities are placed in things we "think" we should do, instead of things we love to do or need to do.The problems arise when we either suppress our excitability, or let them go out of control. To really get the most out of our energy, we must learn to harness our power. Think of the movie Frozen. It has been very popular lately, partly because it breaks the damsel in distress mold of the standard Disney movie, but also because it addresses a very real issue in many people's lives. When Elsa looses control of her powers, she hurts someone she loves. In an attempt to control her power, she tries to suppress it. In the process, she isolates herself and her sister and ends up loosing control all together. This is true of many of us when we try to suppress an essential part of us. Either we feel isolated or incomplete, or we leave ourselves vulnerable to an explosion of suppressed power. It isn't until she learns to control her power and use it when and how she wants it that she is able to fully realize her potential. When you get a clear picture of your own powers, you can better recognize when they are suppressed or getting out of control. My goal is to help those who are highly excitable find ways to use it to their own advantage so that they can reach their highest potential. Sign up for my free Excitability Checklist here to find your own unique Excitability traits.